(April 2012) Just returned from my trip to Belize. 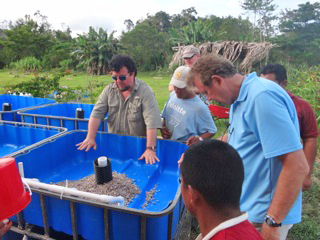 We had a great trip and we were able to put up two aquaponics units 33 miles back in the rainforest. Some people call it the end of the world. We set up shop in Punta Gorda. This is a small city of just over 5,000. The people are very humble and kind. Larry and his wife, Karol, let us set up shop in the back of their hotel, the Sea Front Inn. We sent native helpers to get all the parts that were needed and cut out the IBC totes. It was not easy finding the totes, two came from a rain-catch system three stories high and had to be lowered by rope. The second set was taken from a nearby eco home. Sacrifices were made. It took us a day and a half to find materials and cut out the units. We had to go to a dolamite plant to get gravel and they pre-washed it for us and bagged it on site. We had 2100 pounds of gravel alone. The main team consisted of John Musser, Barry Jones, Larry, Beto, Diago, and Roberto. Others came to help at various times but names slip me. We took a large trailer and packed everything on it including fish water for inoculant! Most of the times we could only travel about 5-7 miles an hour traveling 33 miles into dense jungle, which is reported to be some of the thickest in the world! When we got to our site location, we only had about four hours to get everything put together, as there was no electricity. We made good progress and when lunch came, we had some Habanero Soup which I really loved! We had a hot lunch and then back to work. We really had to improvise at times as we did have a battery drill and we had to cut some important holes. Some of the workers picked up the units and took them across the street. We hooked up a crude drill to a small generator and we were back into action, it was fun! The totes were finished by nightfall. Then after dark we finished the small compost pile as the icing on the cake. I found the people very kind, hard working, and intelligent. My next trip will be to hook up solar to the system. For now, it is a bucket-ponics system. Since the trip, we have received a request to help develop our system in Putgo, which will be another journey. We give specials thanks to Sunshine Rotary of Tyler for sponsoring this project, Barry Jones for leading the group, and our good friends back in Tyler: Dr. Nickels, Jo Dobbs, Billy Hibbs, and others who held the ropes! We appreciate you stopping by. Let us know in the comments your ideas for future projects or thoughts on these existing projects or articles. 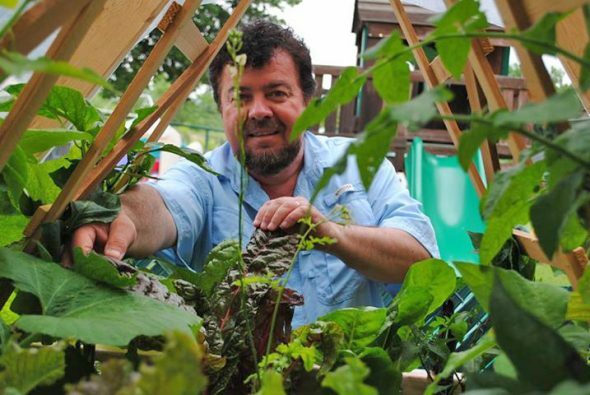 © Copyright 2019, Aquaponics and Earth, a 501c3 non-profit organization (#30-0523041). All Rights Reserved.